In the Distributor Network Manager, the administrator for the company can manage, maintain and purchase licenses for each ASI application. The first area that will display is the Overview section, which displays your company’s applications and number of licenses at a glance. 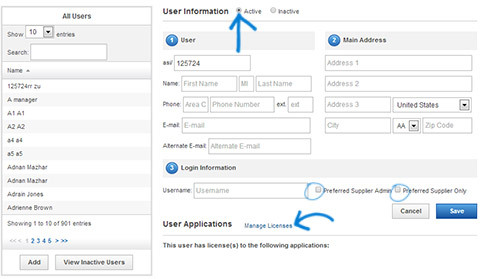 To access the Licenses and Users Admin in ESP Web, go to your avatar and select Licenses and Users from the dropdown. In the Administrators section, you can manage which users have administrative rights for various company management functions. 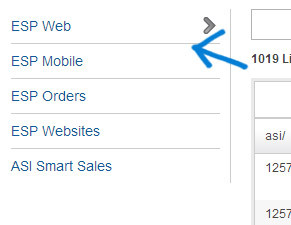 To access this section, click on Administrators from the toolbar. You can view all of the users who have access to manage that admin area. You can edit or unassign the licenses for an admin in the Administrators area. On the left hand side there will be a list of all of the administrative functions for your company. Clicking on the administrative functions will open that function’s license manager so that you can manage the administrators. At the top of the Admin Licenses section, there is a search function which is a partial match search of the Name, Username, and Email fields. Also, the headings in the Admin Licenses area can be used to sort alphanumerically. Under the last heading, Actions, there are two links: Edit and Unassign. Clicking on Edit will pop open the Edit License window where You can view the assigned application, license number, status, and start date. You can also edit the user’s role or use the dropdown assign this license to another user in your company. The Assign License button in the lower section will enable you to give a user a license to be an administrator for the function you have selected from the left menu. In the Manage Licenses section, you can view all current licensees for their company, as well as edit licensing information, assign or unassign licenses and export the license list. On the left hand side there will be a list of all of the applications for your company. Clicking on the application name will open the license manager so that you can manage the licensing for that application. At the top of the Manage Licenses section, there is a search function which is a partial match search of the Name, Username, and Email fields. Also, the headings in the Assign ESP Web Licenses area can be used to sort alphanumerically. Under the last heading, Actions, there are two links: Edit and Unassign. Clicking on Edit will pop open the Edit License window. In Edit License window, you can view the assigned application, license number, status, and start date. You can edit the user’s role or use the dropdown assign this license to another user in your company. When you are finished making changes, click on the Save button. 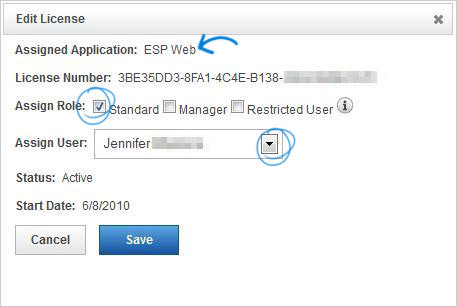 If you click on the Unassign link, the license will be added to the Unassigned ESP Web Licenses area. The Unassign ESP Web Licenses area is located below the Export List options. Clicking on the Assign License link will open the Edit License window. Directly below the Assign ESP Web Licenses area, there is the Exporting Options. 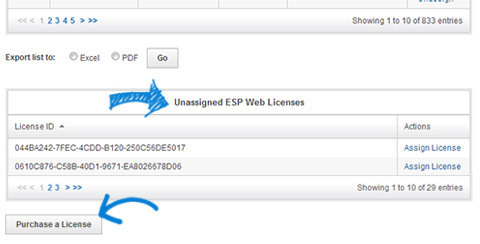 You can export the Assign ESP Web License list as an Excel spreadsheet or as an Adobe PDF. Click the radio button for the option you would like to use and then click on Go. 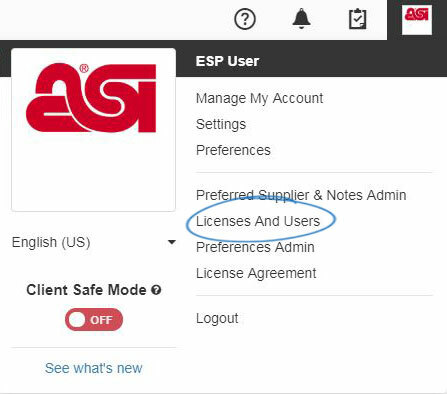 If you are in need of an additional license, but none are available in the Unassigned ESP Web Licenses area, you can click on the Purchase a License button. An email will open for you to request an additional license be added to your account. Cick on the Manager Users button from the toolbars. In this section, you can activate or deactivate users, update their information, and assign preferred vendor administration capabilities. You can also view which applications each user can access. The Manage Licenses link in the User Applications section will bring you to the Manage Licenses area. On the left, you can show up to 100 users per page or you can start typing a name into the search box. When using the search box, results will instantly display as you are typing. If you select a user from the listing on the left, their information will be editable in the User Information area. You can also update the Main Address information and the user’s login name. 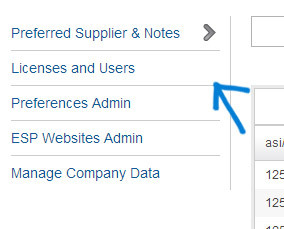 To make the user a Preferred Supplier Administrator, just check the corresponding box. After you have finished making changes, just click on the Save button.